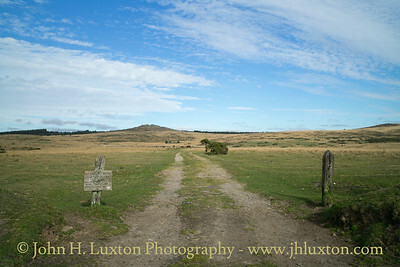 The Hexworthy, Holne and Dartmeet areas of Dartmoor. 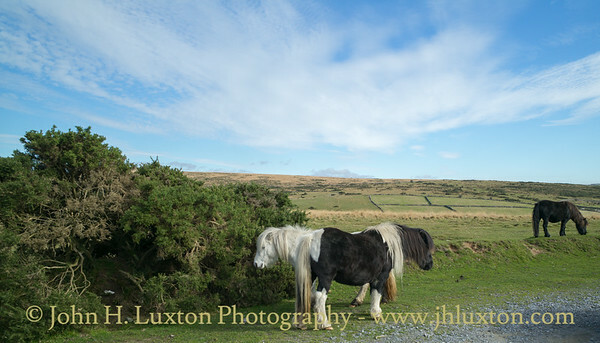 Dartmoor Ponies near Dunnabridge. 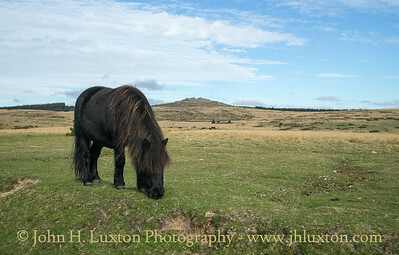 Bellever Tor can be seen in the background. 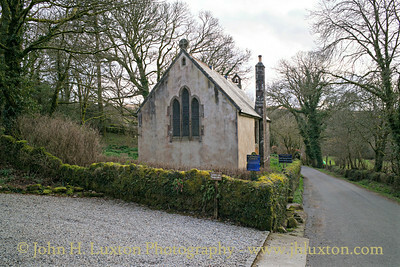 St Raphael's Chapel was originally built in 1869 by the then Rector of Lydford, the Rev. Morris Fuller, as a mission chapel. 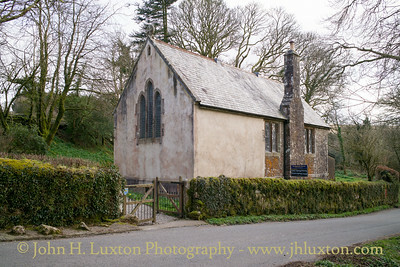 He wanted to provide a place of worship to those parishoners who lived too far from the parish church at Lydford, which was the largest parish in Dartmoor and one of the largest in the country. He also built the church of St. Gabriel at Postbridge for the same reason. According to William Crossing, the great Dartmoor writer, it was built on the site of some very old ruined cottages that were thatched with rye straw. 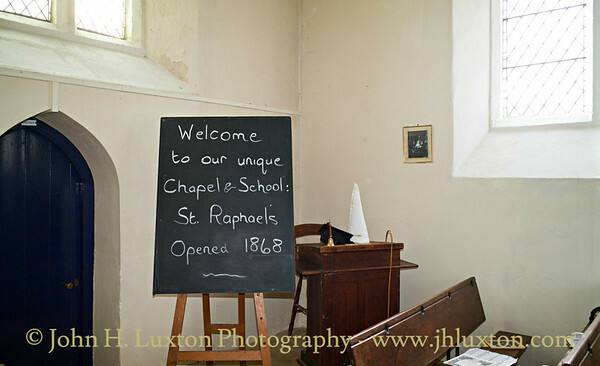 St Raphael's was also designed to act both as a place of worship on Sundays and as a schoolhouse during the week. The scholars's desks remain in place today and are used as pews. A memorial on the south wall is dedicated to the memory of Olive Louise Munday, who died in 1960 and was a member of the Burnard family who lived at Huccaby House. 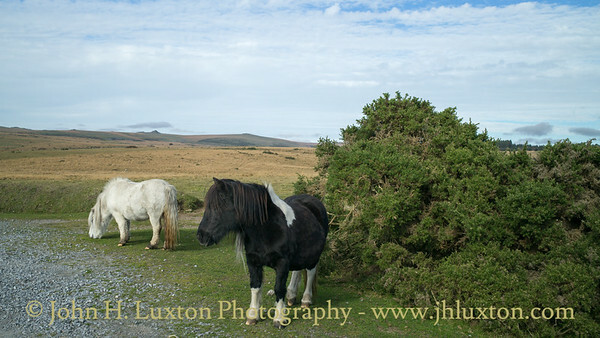 She was the eldest daughter of Robert Burnard, the Dartmoor enthusiast and writer, and also mother of the late Lady Sylvia Sayer, the former patron of the Dartmoor Preservation Association. 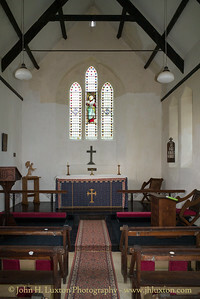 The 'Good Shepherd' window behind the altar was donated by the Adams family of Huccaby, in memory of Edward Arthur Adams, who died in 1888 aged 11 years. In 2012, St Raphael's became a daughter church of St. Mary the Virgin, Holne. 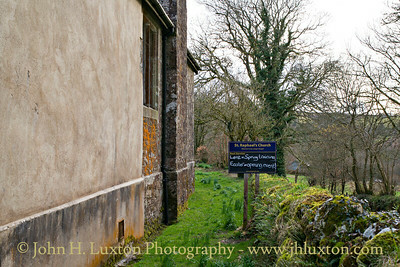 St Raphael's was originally built in 1869 by the then Rector of Lydford, the Rev. Morris Fuller, as a mission chapel. 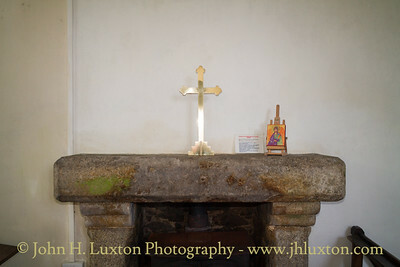 He wanted to provide a place of worship to those parishoners who lived too far from the parish church at Lydford, which was the largest parish in Dartmoor and one of the largest in the country. He also built the church of St. Gabriel at Postbridge for the same reason. According to William Crossing, the great Dartmoor writer, it was built on the site of some very old ruined cottages that were thatched with rye straw. St Raphael's was also designed to act both as a place of worship on Sundays and as a schoolhouse during the week. The scholars's desks remain in place today and are used as pews. A memorial on the south wall is dedicated to the memory of Olive Louise Munday, who died in 1960 and was a member of the Burnard family who lived at Huccaby House. 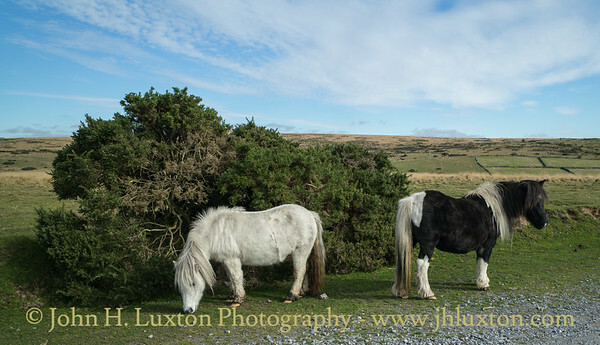 She was the eldest daughter of Robert Burnard, the Dartmoor enthusiast and writer, and also mother of the late Lady Sylvia Sayer, the former patron of the Dartmoor Preservation Association. 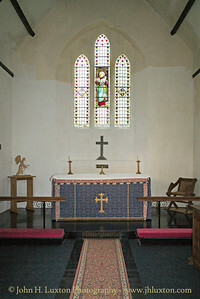 The 'Good Shepherd' window behind the altar was donated by the Adams family of Huccaby, in memory of Edward Arthur Adams, who died in 1888 aged 11 years. 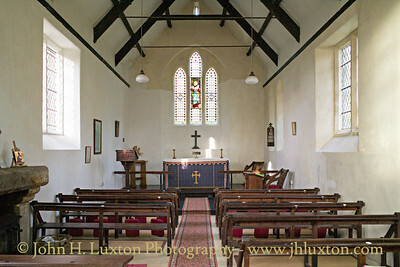 In 2012, St Raphael's became a daughter church of St. Mary the Virgin, Holne. "Your are not getting back in your car unless your feed me!" This pony decided to stop me getting back in the car and was looking for food as it tried to put its head through the open window! 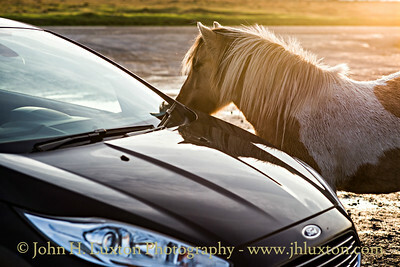 Ponies see cars as a source of food and that can have unfortunate consequences. I didn't feed this fellow but had to wait about 15 minutes until he realised he was not going to get fed! 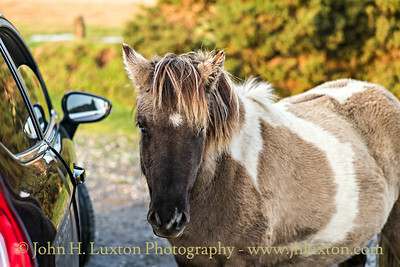 Cars are an attraction to the Dartmoor Ponies which can have unfortunate consequences. 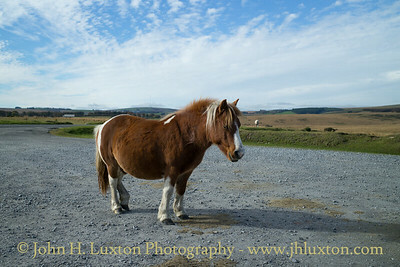 They see them as a source of food which quite often they are and visitors should not feed them anywhere near the road. 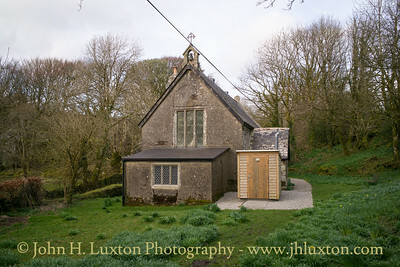 St Raphael's was originally built in 1869 by the then Rector of Lydford, the Rev. Morris Fuller, as a mission chapel. 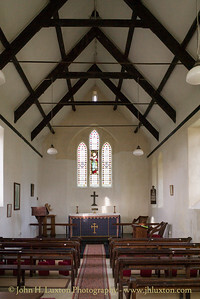 He wanted to provide a place of worship to those parishoners who lived too far from the parish church at Lydford, which was the largest parish in Dartmoor and one of the largest in the country. He also built the church of St. Gabriel at Postbridge for the same reason. According to William Crossing, the great Dartmoor writer, it was built on the site of some very old ruined cottages that were thatched with rye straw. 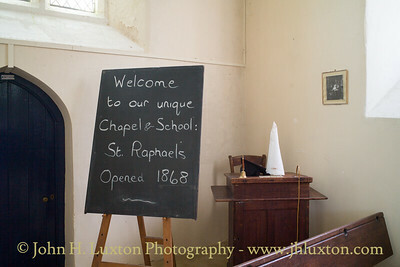 St Raphael's was also designed to act both as a place of worship on Sundays and as a schoolhouse during the week. The scholars's desks remain in place today and are used as pews. 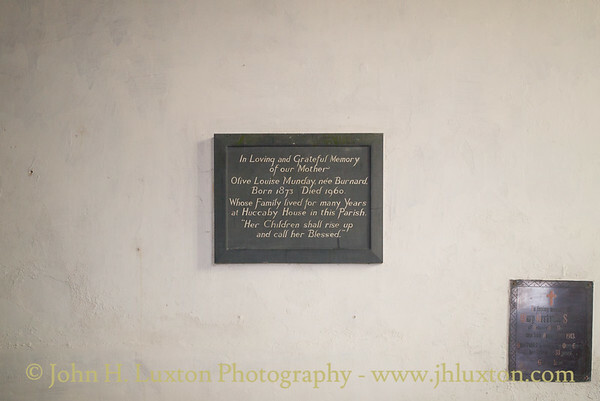 A memorial on the south wall is dedicated to the memory of Olive Louise Munday, who died in 1960 and was a member of the Burnard family who lived at Huccaby House. 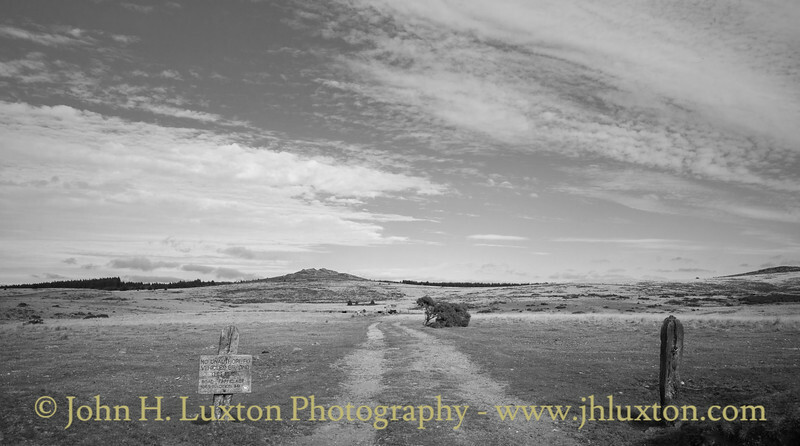 She was the eldest daughter of Robert Burnard, the Dartmoor enthusiast and writer, and also mother of the late Lady Sylvia Sayer, the former patron of the Dartmoor Preservation Association. 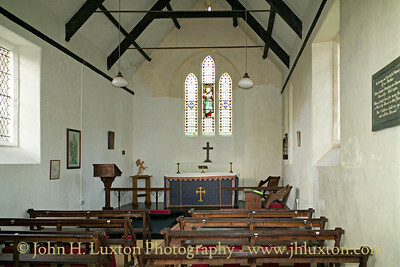 The 'Good Shepherd' window behind the altar was donated by the Adams family of Huccaby, in memory of Edward Arthur Adams, who died in 1888 aged 11 years. In 2012, St Raphael's became a daughter church of St. Mary the Virgin, Holne.